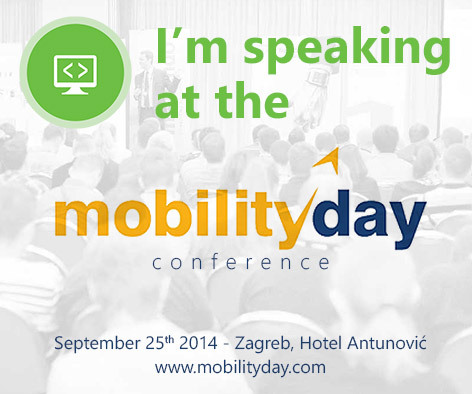 MobilityDay conference is one of the best conference in the region about mobile technologies. It is one day conference, with several slots and great speakers from the whole Europe. Also most of the speakers hold MVP award. Every year I am visiting this conference as attender or as a speaker, because I spend great times there. This year I am going to visit this conference as a speaker for the second time and I am very happy for that. I will be speaking about .NET Native precompilation techologiy which ordinary .NET application converts in to super fast application, as the same as VC++ would do. This is long waiting technology from Microsoft and the next version of the .NET will be armed with this great feature. Come to Zagreb at Thursday at Hotel Antunovic and spend great time on the best conference about mobile technology. NET developers for years are faced with opinions that NET applications do not have the performance of native applications, and the reason is compiling IL code during execution of the application. On the other hand, there is a mountain of unnecessary library as an integral part of the NET Framework to create a “dependency” on the application themselves. Mirosoft in the next version of the NET Framework and Visual Studio wants to offer an entirely new way of distributing NET applications by offering the same compile the IL code, which is then over the NET native compilers translate into machine code in the same way as it would appear one VC ++ applications. With this move, Microsoft NET allows developers to develop high-performance applications, while retaining the maximum productivity of writing code that has C #. The lecture will present a Native NET compiler, and how to develop with him NET applications, high performance and which do not depend on the NET Framework. This entry was posted in .NET, C#, Konferencije and tagged .NET Native, C#, MobilityDay by Bahrudin Hrnjica. Bookmark the permalink.